Hot deal! 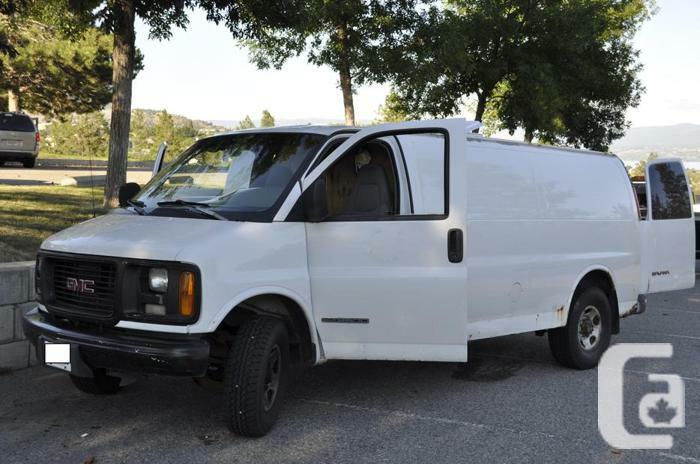 - BC Safety Certified - GMC Savana 3500 Ext. uniquely converted to a comfortable and fully autonomous camper van. Abundant insulation (ceiling, walls, floor), Hot shower cabin and propane water heater + indoor air heater connected (new 8kg bottle included), auxiliary 150Ah RV/Marine battery and 1000W AC power converter on-board, running water with electric bilge pump, nice kitchen, lots of storage, 20L lug-a-loo toilet and foldable bed with spring matress. Ideal for urban and rural full stealth camping with an appearance of a simple construction van. Comes with new BC saftey certificate (08/14/2018), we can handle the transfer/registration together at an Autoplan Broker/ICBC if you wish. All brake lines and a caliper are also brand new (08/14/2018). Breakeshoes, starter and battery were redone/new according to the previous owner. I bought it last spring, built all interior new and drove it not even 8k. She runs excellent - and inside now the perfect mix of function and luxury home on wheels. - Hot shower with installed gas water heater (25L insulated water tank). - Exhaust pipe with active blower, hided under the van - no chimney visible - stealth! - Auxiliary battery voltage display with Micro USB Charger for smartphones etc.